I was given this book to read by a friend of mine because I was actually getting fed up of wasting time on Facebook all the time. Don’t worry I’m back…!! But the book was a very interesting read about what happens behind the scenes in the air travel industry. The way it is written is interesting, as it has the fiction essentials: main characters and an interesting plot. However, all of the incidents and characters are supposedly true – albeit a bit squashed into 24 hours. This book made me want to be nice to every person working in an airport. Especially to the people at the check-in counters. They are the demi-gods who decide your fate of where you will actually end up sitting. Be horrid to them and they stick you between the 250lb sweaty man and the harassed mummy with the screaming 7 month old baby. 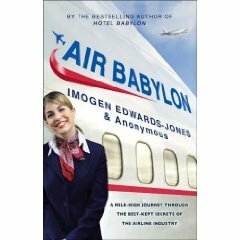 If you care to know what really goes on in the cockpit and behind-the-scenes at airports, then read this book. Don’t bother though if you don’t have a sense of humour, and think that air stewards are braindead waiters in the sky who don’t deserve some respect. I enjoyed the book. It was quite an insight! !